“That was ugly” quipped by brother. “Good thing you’re not a pro, your family would starve” remarks another brother. My playing partner just sneers at me. Another typical round of golf with family and as usual, I missed that dreaded 2 footer. For me, it costs a mere ounce of pride and some dignity which will be regained with a round of drinks at the 19th hole. But as I sat down in the cart, I thought about my brother’s comment and what the professional golfer would lose. Just exactly how much does he pay for the same missed putt? The answer depends on your rank on the PGA Tour. Naturally the higher you are ranked the more likely you are to earn greater dollars by taking first, second or third prize. Most commonly, the first place winner earns more than a one million dollars. Second place usually earns in the $600,000 range and third drops down to less than $400,000. So in a single tournament, that one stroke could cost more than half a million dollars. But I’m interested in the overall average for a season. This calculation is based on the 2012 season for information through October 2012. The standard is set by Rory McIlroy. He had the lowest stroke average at 69.63 and the highest earnings. Tiger was second with a stroke average a mere .15 strokes higher per round of golf. He earned $180,311 less on average per tournament due to his stroke average being .60 (.15 x 4) higher over the four rounds of golf in comparison to Rory. So for Tiger, each time he casually approaches that 1 to 2 footer and misses the putt, it costs him $300,000 ($180,311/.60). As the ranking decreases (heads toward 50th place) in stroke average, the average earnings of the golfer decreases as well. So for Ben Crane, (50th in stroke average in 2012 to date) his stroke average is 1.11 higher than Rory per round, 4.44 strokes worse in a tournament. On average he earns $398,000 less than Rory per tournament or around $90,000 per stroke. 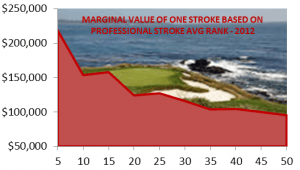 The graph to the right illustrates the value of a single stroke in golf, to a professional golfer, based on his rank, in accordance with his overall season stroke average. There were some anomalies. Phil Mickelson is ranked 26th overall and earned a whopping $4.2 Million for the year. He is ranked 8th in earnings, thus the little increase at the 25th ranking on the graph. So for Phil, it costs around $86,700 per missed putt. This is due to the number of victories he earned during the year. So timing does have a significant bearing on the final cost. But the graph illustrates the overall average. For those ranked around 150th in comparison to Rory, almost 2 strokes more per round of golf, each stroke costs around $56,000. It does make sense, because for those of us who rank around 10 millionth in scoring average in comparison to Rory (i.e. I stink at this game), the cost is miniscule. A round of drinks and a few laughs aimed at my expense. You too can understand this difference; if you are a scratch golfer, it costs you a few dollars and some pride. For those golfers that we see on TV on the weekends that haphazardly slap the putter against the ball for a 1 footer and miss, well, they pay for it dearly with a much smaller check on Sunday night. Act on Knowledge.